You wouldn’t have wanted to sit next to me in the family van after a loss in little league. I’d kick myself for every little mistake -- if I got a hit in three out of four at bats, I’d fixate on that fourth one. If I was pitching and threw a bad pitch that led to an RBI double, I’d replay it in my head over and over more times than ESPN said the word “Deflategate” in the two weeks leading up the Super Bowl. My parents would try and cheer me up, but I wouldn’t hear any of it (Sorry, Mom and Dad). It didn’t matter to me that baseball is a team sport or that 95 percent of the outcome of any given game was out of my control. Somehow, it was my fault that my team lost. There was something wrong with me. Even now as a 24-year-old grown adult, I still struggle with that little leaguer mentality. And after a while, it always starts to take a toll. Some “losses” still bring out the worst in me. Anger. Pride. Jealousy. Bitterness. Discontentment. And I hate that. I hate to see that I still struggle with these things in my own heart. I hate to see failures open up wounds that I thought were healed. I hate admitting my own weaknesses and I’ll beat myself up for having them in the first place. I start to hear: Joel, look at all the choices and all these mistakes you’ve made -- you are such an idiot. Look at these emotions that are wrecking you -- you are so weak and useless. Look at that failure -- it’s all your fault. I’ll start to look at my own reflection in the mirror and not like what I see. I’ve always struggled with grace and forgiveness -- particularly for myself. I’ll demand perfection of myself and when I predictably fail to meet that ridiculous standard, I’ll beat myself up for it. Maybe you struggle with this, too. I’ll tell you what some close friends have told me: You’ve gotta give yourself a break. We need to give ourselves some grace. I’m not perfect. You’re not perfect. And we’ll never be perfect. And that’s okay. God doesn't demand perfection of us. Yet, we somehow expect ourselves to be perfect. We can give ourselves grace because God has already extended grace to us as a gift. And His grace is enough. It’s more than enough. It never runs out. It never fails. It’s always available to us. No failure is final. No pain is permanent. No mistake is too much to come back from. Too often we beat ourselves up for things that God has already forgiven us for. We remember things that God has already forgotten. We dwell on the past when God is trying to guide us forward in freedom. We hold on to things that God wants us to let go of. When we withhold grace from ourselves, when we continually belittle ourselves for past mistakes and failures, we’re robbing ourselves of the joy, peace and rest found in Jesus. Not only that, but it also becomes much more difficult to extend grace and forgiveness to others if we can’t even offer it ourselves. What are you beating yourself up over? What scenes are you replaying in your mind over and over? What kind of things are you saying about yourself? Give yourself some grace. Allow yourself to take a step forward. And another. And then another. Give yourself a break and relieve yourself of a burden that you were never meant to carry. You have no idea how much God is speaking through you! I just read I John 1 this morning before reading this post. It's amazing to receive God's confirmation through your blog posts. Thank you for being obedient to His voice. Hi Joel... 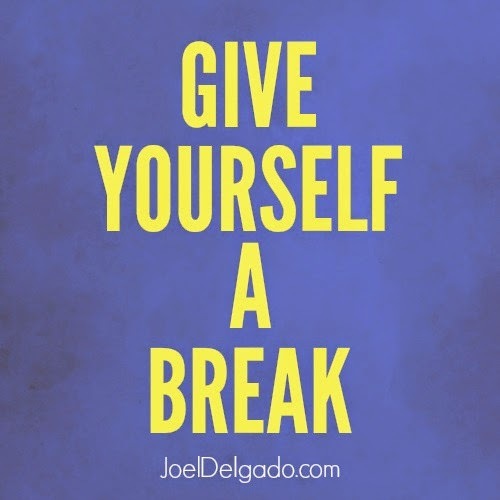 I appreciate your post and all the different ways you encourage us to Give Yourself a Break! It is so wonderful to find someone like-minded. I have a book called Give Yourself a Break: Turning Your Inner Critic into a Compassionate Friend coming out 7/7/15. It is the only book out that teaches about self-compassion integrated with our faith. Thanks so much for your heartfelt and very important post.